Are you Searching for an Arizona Active Adult Retirement Community? 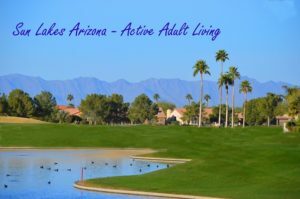 Sun Lakes Arizona is a top choice for Arizona active adult retirement communities. Location, Affordability and Amenities are just three of the reasons people choose Sun Lakes for their retirement home. 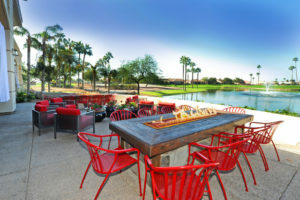 Sun Lakes is located in the southeast valley of the Phoenix area bordering Chandler. Nearly 10,000 homes in five separate communities comprise the Sun Lakes retirement area developed by Ed Robson. Choose from single family residences or villa single story flats that range in size from 1,100 to over 3,500 square feet. Homes are affordable in the range of $100,000 to over $600,000 with homeowner associate dues below $2,000 annually. If you enjoy views, select a home that is located on the golf course or waterfront. Enjoy privacy? Plenty of homes offer block fence construction so you can enjoy your morning coffee in the privacy of your back yard. The communities in Sun Lakes Arizona are Sun Lakes Country Club, Cottonwood, Palo Verde, Ironwood and Oakwood. The newest home in Oakwood was built in 2006. Many homes have been remodeled so that are move in ready! Just bring your clothes, unpack and start enjoying the resort lifestyle. Speaking of lifestyle, you will love the many activities offered in Sun Lakes. See Sun Lakes AZ homes for sale here. When you buy a home in Sun Lakes Arizona, you are buying a lifestyle second to none. Imagine golfing on one of the 99 holes of golf. Enjoy a competitive or relaxed game of tennis or pickle ball at one of the racquet centers. Swim in one of the 12 swimming pools or get in a round of exercise in the fitness centers. If that isn’t enough, try one of the hundreds of clubs available like the Sun Lakes Hiking or Biking Club. The camera club is available for novices or expert instruction. Card clubs abound in Sun Lakes Arizona. You can find virtually anything you enjoy and if not, start something! Are you ready to take the next step to find a home in Sun Lakes Arizona? Contact us here or call 480-440-0849.